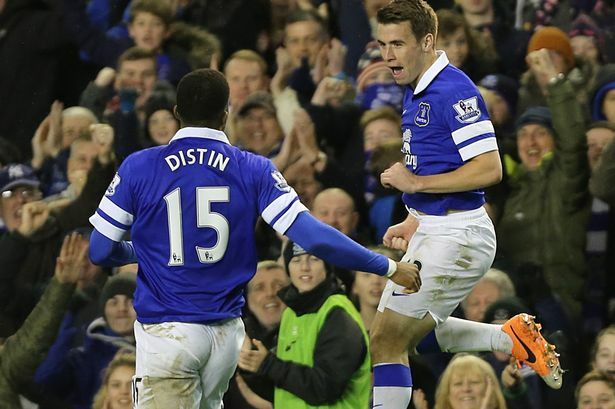 Seamus Coleman: Player of the season so far? A recent supporters poll on the Official Everton website showed that Seamus Coleman is considered to be the player of the season so far, and with the form he has been in, it is hard to argue against that. An opening day goal away to Norwich proved a sign of things to come this season, as Coleman has brilliantly gone on to bang in six in all competitions so far, and it seems as though double figures beckon for the Irishman. Everton fans have been delighted with how Coleman has adapted his overall game this season, turning into one of the best attacking full backs in Europe and his most recent goal against QPR in the FA cup was a perfect example of just how he has been pleasing fans this term. To be more specific, Coleman’s movement for the goal was excellent, as he effortlessly timed his run to the edge of the box to get onto Ross Barkley’s pass and fire majestically into the Gwladys Street End goal. The timing of Coleman’s arrival into the box is something that has proved to be a strong component of Everton’s attack this season and it is clear that Martinez has worked on this part of his game. It was not the first time this season that he has arrived late to get in ahead of the defenders and slot home, and it is likely that it won’t be the last either. The strike itself was also impressive, with Coleman side footing the ball, yet still putting enough spin on it to put it into the corner out of Julio Cesar’s reach. To top it all off, the no-nonsense celebration was also commendable and it served as a reflection of the type of player Coleman is, someone who doesn’t crave the limelight, yet someone who shines in it. And shining he is indeed, as at the time of writing, Coleman sits second in Everton’s highest scorer list for the season and all his goals have come from open play. Having said that, the goals are not the only reason Seamus Coleman has been so well thought of so far this season. Although he did start off the season defensively susceptible, such as against Fulham in the League Cup, he has gone from strength to strength in recent games and his defending is proving just to be as important as his attacking. With reference to his performance at Stoke, it could also be argued that Coleman could have got out quicker to close down Assaidi to prevent the goal, but apart from that he was sound enough at the back. As the season has gone on despite some early blips Coleman has shown to be dependable both attacking wise and defensively, and for the sake of a further stat attack, data shows that Coleman’s tackle ratio is 65% successful this season, with him coming out on top 35 out of 54 times. There is an argument for room for improvement here, but still it is encouraging reading all in all. If there have been any criticisms to make of Coleman this year it would be in the defensive area of his game, but it is hard to hold anything against him when he offers so much more than the standard right back. 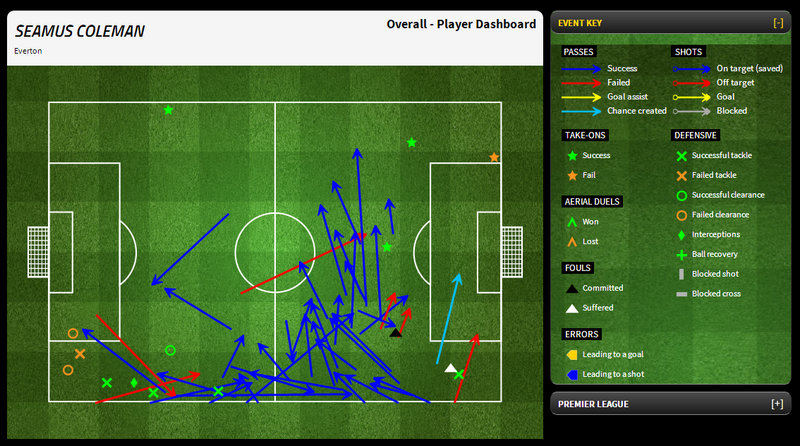 Also shown in the above summary, are the passes Coleman made throughout the game against Stoke. Noticeably, the majority of his passes came in the opposition half and it is evident Coleman plays a vital part in the build-up play and is a reliable option for team mates to pass to. It is clear that Seamus has adapted well to the passing game Roberto Martinez has instilled and with regards to the season as a whole, Coleman boasts an 88% pass completion ratio, meaning he has made 623 successful passes this year. The stats show he is comfortable on the ball and not afraid to be positive and this really benefits the side. In general he has developed soundly in each aspect of his game, but what is most pleasing is that he has emerged to offer Everton a marauding threat down the right hand side of the pitch, something that has certainly been lacking in recent years. The current season has certainly been Seamus’ most impressive to date, and at just 25 years old, there is still massive potential for him to improve even more. Although only half the season is gone, and the likes of Ross Barkley and James McCarthy (just to name a few!) have also been excellent, it will be hard to look past the man from Donegal come the actual end of season awards. Do the fellow St Domingo’s readers agree? Has Coleman been your player of the season so far? Previous Post Everton move for Ince, but how much will they have to pay?